Hey guys! 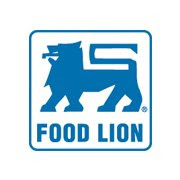 If you live in an area with a Food Lion grocery store, you might have noticed some changes in some of the stores. They have been updated, making the store look brighter, more inviting and very organized. The shelves are well stocked with a lot of the great name brands you use as well as the Food Lion brand of items including the "My Essentials" line. I received a very generous $150 gift card through Mom Central as a Food Lion Ambassador and got to see how far I could stretch it. I was totally up for the challenge! I made my list and headed to a brand new store that recently opened in my area. I will say that the first thing I noticed was the gorgeous produce department filled with such beautiful, fresh fruit and vegetables. I pleased with the prices and quality. I did grab some essentials as well as a few extras for some special meals. The prices on the organic items were very fair. I went up and down each and every aisle and compared prices on both name brands and the store brand. 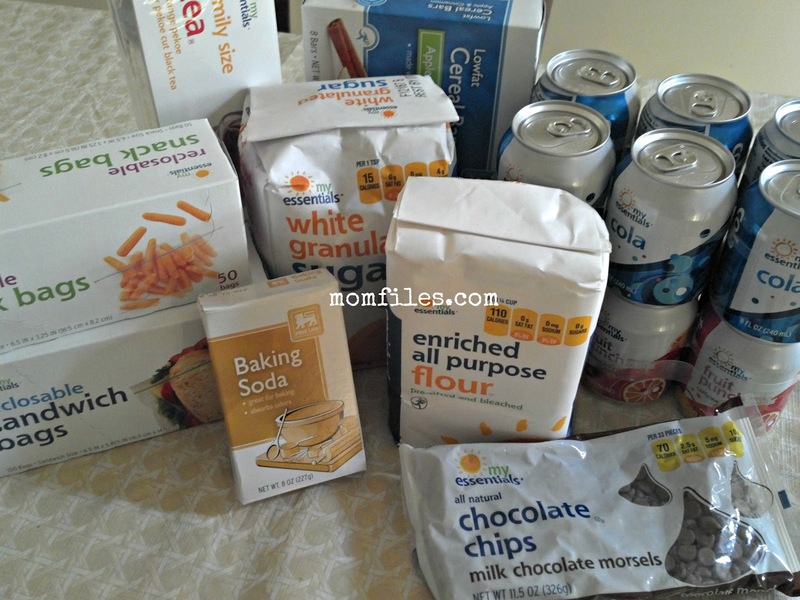 I found that some staple items I buy were a lot cheaper such as sugar, iced tea bags, flour and a lot of the non-grocery, household items. Now the make it or break it part of any store for me is the meat, poultry and seafood department. I was really happy with the prices, especially on beef. I don't buy beef often because it is usually way too expensive. I was so happy to be able to buy enough protein items for almost 2 weeks without feeling like I was going to have to take out a loan to pay for my groceries. Something that really got me excited is the selection of ethnic food products that they carried. I use certain types of seasonings are very hard to find in my city and I found them there! Not only did they have more than I would ever want, the prices were SO LOW! *happy dance* My overall shopping experience at Food Lion was a wonderful one. I was treated well and felt like everything was very easy to find and I did not feel like the store was cluttered. I also was able to walk out with a very full cart load of groceries and household items and still have a small balance left in my gift card! 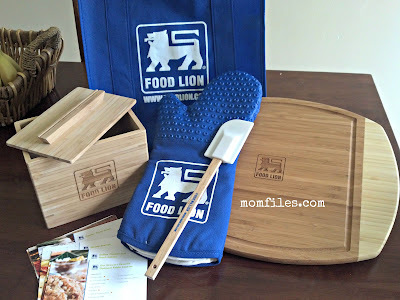 Here are some of the great items I received in my Food Lion Ambassador Kit. I love the wooden recipe card box that came with a nice set of recipe cards. I asked my teenage daughters to pick something they wanted me to make and surprise, surprise... they picked something sweet. They chose the "World's Best Chocolate Chip Cookies" recipe. I did ask after all! I purchased almost all of the ingredients in the store brand with the exception of maybe 3 things I already had at home. 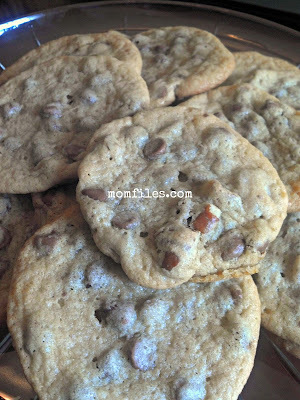 I have made many chocolate chip cookies in my lifetime and I have my usual go-to recipe that I have used for years. I decided to try out the Food Lion recipe. I won't lie, I was a bit nervous because I have never made any baked goods with store brand items. Oh my gosh, they came out AMAZING! They were a bit flatter looking than what I am used to but the taste... I can compare it to a local bakery that sells their chocolate chip cookies for $1.29 each! They had a great chew and crispiness at the same time and were not too sweet. I separated the dough and added pecans to one half since the girls like them with just chocolate chips. I absolutely must share this recipe! 1. Preheat oven to 375 degrees or according to how your oven bakes. 3. Beat butter for 1 minute or until smooth. Add the sugars and beat for another 2 minutes. Add the vanilla and eggs, one at a time, beating for 1 minute after each egg goes in. 4. Reduce speed to low and add the dry ingredients in three portions, mixing until each addition is incorporated. Fold in the chocolate chips and nuts. 5. I then chilled the dough for it to firm up and formed them into balls. I baked them on a cookie sheet for about 11 minutes and transferred them to cooling racks. I made this for dinner the same day I baked the cookies. 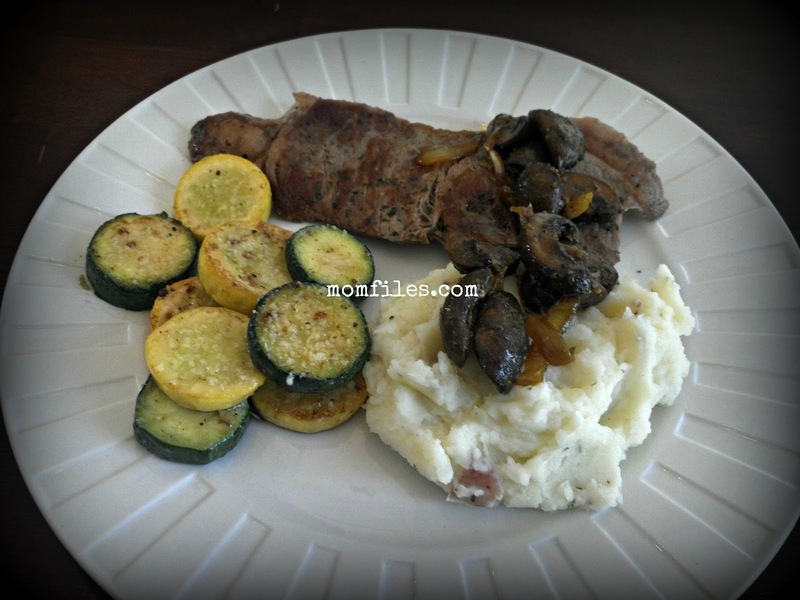 I bought some fresh rib-eye steaks that I pan seared in my cast iron pan, sauteed mushrooms & onions, homemade garlic mashed red potatoes and some sauteed zuchinni & squash topped with Parmesan cheese. This meal fed my family for only $24. Not bad and you won't be able to get that price at any restaurant! This giveaway is open to US Residents only and winner is only eligible to win one gift card per campaign. Giveaway will end on August 8, 2012. One winner will be chosen at random and contacted by email. You must complete mandatory entry in order to qualify for extra entries. Momfiles is not responsible for any lost or stolen prizes. Good luck! 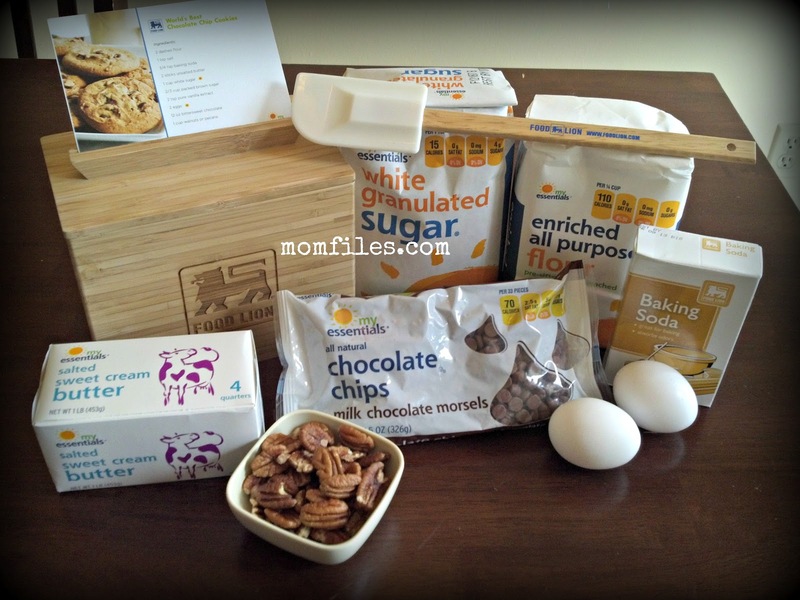 I participated in a campaign on behalf of Mom Central for Food Lion. I received a gift card and product kit to facilitate my review.